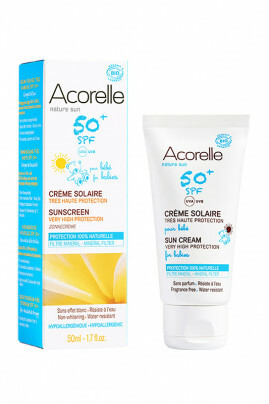 Acorelle Organic Baby Sun Cream SPF 50+ offers maximum protection for baby's delicate skin. Composed of a mineral and natural sunscreen, it reflects the sun's rays and acts as a real barrier against UVA and UVB. Fragrance-free and hypoallergenic, it respects the sensitive skin of children. Rich in floral water of organic Damask rose with soothing virtues, it brings comfort and softness. Easy to apply, its creamy texture quickly penetrates the skin for effective protection even in water! It also leaves no white trace. Its tube format is easy to carry. Biodegradable, Acorelle Organic Baby Sun Cream SPF 50+ is ideal for babies from the age of 3 months. A degree of protection 50 to protect baby from the UV rays of the sun! Shake the tube of cream before use. Before sun exposure, apply the organic baby sun care on the entire body and face of your child. Repeat the application frequently to maintain maximum protection, especially after the baby has sweated, swum or wiped. Do not expose baby too long to the sun, even if a sun protection product is used and avoid exposure between 12h and 16h. Overexposure to the sun is a serious threat to health. Do not expose babies and young children directly to the sun. Wearing a hat, sunglasses and a covering garment is highly recommended. To protect babies and young children from indirect exposure, apply enough of the product to the face and body. Repeat the application frequently to maintain protection. Suitable for children from the age of 3 months. Preserves before and after opening, protected from light and heat, in a clean and dry environment. Organic and natural ingredients for a baby sunscreen! DICAPRYLYL CARBONATE, TITANIUM DIOXIDE, AQUA (WATER), ROSA DAMASCENA FLOWER EXTRACT *, CERA ALBA *, ALUMINUM HYDROXIDE, STEARIC ACID, POLYGLYCERYL-3 DIISOSTEARATE, SORBITAN ISOSTEARATE, POLYGLYCERYL-3 POLYRICINOLEATE, POLYGLYCERYL-6 STEARATE, GLYCERIN, SESAMUM INDICUM OIL *, PORPHYRA UMBILICADIS EXTRACT, BISABOLOL, HELIANTHUS ANNUUS (SUNFLOWER) SEED OIL, TOCOPHEROL, SORBITAN CAPRYLATE, SODIUM BENZOATE, POLYGLYCERYL-6 BEHENATE, POTASSIUM SORBATE, CERATONIA SILIQUA GUM, XANTHAN GUM, CITRIC ACID.